Corvallis is a city located just east of the coast in Oregon. The small city is home to roughly 55,000 people. Tucked away in the Willamette Valley, Corvallis has beautiful summers, and mild but rainy winters. Good weather and views of the Cascade Mountains make the city a beautiful little gem of western Oregon. The most important institute in the city is Oregon State University. This contributes hugely to the local economy by functioning as a major employer, and by drawing a large student population of over 30,000 to the town. It is a major research University, being one of only two Universities in the country to have land, sea, space and sun grant designation. The rainy winter season in Corvallis can actually be a surprisingly good time to look for apartments. As anyone in business can tell you, rainy days tend to keep customers at home. This helps you when you're looking to get a jump on the competition and find a great apartment. Corvallis landlords have to contend with a very high vacancy rate. This can make them eager to get people into their suites. However, don't let the easy availability fool you into taking a lower quality apartment. Make sure to do your due diligence and view the place in person and read the lease over carefully before you sign any paperwork. The Corvallis Transit System has bus routes that run throughout the city. The coverage and service is relatively good, but there are no busses that run on Sundays. If you need to get around on Sunday you're going to pretty much need a car. The countryside around Corvallis is perfect for biking and hiking. Like many college towns, the support for the local football team borders on the rabid, so be sure to check out a Beavers game to see what all the fuss is about. Regular events are held at the Majestic Theatre. For some of the best pizza in Oregon, visit American Dream Pizza. Most of the attractions in Corvallis have to do with all the wonderful natural landscape the city is set in the middle of. For someone who enjoys bird watching, or just being in an unspoiled landscape, the William L. Finley National Wildlife Refuge is a must-see. In addition to birds there are numerous mammals, amphibians, reptiles and insects that call the refuge home, including several endangered species. The strong culture of brewing and distilling that has taken root in Washington State and Oregon is also strong around the Corvallis area. There are several local wineries, breweries and distilleries that make for some of the best tourist attractions in the immediate area. A popular option with the University students, Local Boyz Hawaiian Café serves authentic Hawaiian fare. If you're a fan of pizza like most of the college students are, then you should try American Dream Pizza. There are two locations now thanks to it's ever-increasing popularity. Corvallis also has a number of restaurants that are either exclusively vegetarian, or which offer good vegetarian options. Interzone is a perfect example. Their totally organic menu has options to please both vegetarians, and vegans. Corvallis also has a few higher end options that focus on Italian food, including Big River Bar & Grill and Iovionos. With such a strong predilection towards micro brewing in Oregon, it should come as no surprise that some of the best bars in the city are also brewpubs. Block 15 Brewing is a relaxing place to grab a drink while enjoying some excellent beer and casual grub. Flat Tail Brewing is another brewpub that is very popular among the locals. It’s 6AM stout is consistently well reviewed. Downward Dog is another local establishment that is worth visiting if you're thirsty, or even if you're just looking for a bite to eat, as it has among the best pub grub in the city. Corvallis is home to an eclectic cultural mix that offers experiences you can't find anywhere else in the country. The Corvallis Museum, operated by the Benton County Historical Society is a great place to get acquainted with the local area though it’s past. The Darkside theatre is a small independent theatre that allows residents of this small center to see independent films they might otherwise miss out on. Several local venues also feature live music on a regular basis. Big River Restaurant and Bar has music four nights each month. The Bombs away Café also has music on weekends. The Majestic Theatre provides a community arts venue where presentations and performances of all types occur throughout the year. The Corvallis Fall Festival is a great event that celebrates all the best the local region has to offer. There are live performances to accompany the many vendors selling their wares. Street dances during the festival try to get the whole town involved in the festive atmosphere. In July, Corvallis is home to Da Vinci Days, a celebration of technology, science and art, all in the spirit of the work of the legendary Leonardo da Vinci. Nearby, there is the annual Shrewsbury Renaissance Faire each September. From jousting tournaments to performances by bards and minstrels, the festival is sure to delight. Downtown Corvallis is definitely the hottest shopping district in town. The historic buildings that line the streets make shopping a scenic experience as well as a practical one. Most of the stores are independently owned, so shopping downtown helps support local businesses. If convenience and a larger shopping center are more your speed, then head out to the Timberhill Shopping Center. This large mall in the north end of Corvallis has a number of discount and large retailers, including a Ross and WinGo foods. The convenience factor is high, as you can shop for almost anything you might require in a single trip. The Oregon State University athletics program is certainly popular with the people of Corvallis. The OSU Beavers enjoy great support from the town, and many of the younger residents grow up dreaming of being a Beaver some day. The Beavers are a Division I team that competes in the Pacific 12 conference. The strongest rivalry the school takes part in is that between OSU and the University of Oregon. The football rivalry between the Ducks and Beavers is known locally as “The Civil War”. OSU is proud of the fact that more than 100 players have gone on from the Beavers program to eventually join the ranks of the NFL. The backdrop of beautiful Oregon makes exploring the land outside and in Corvallis a pleasure for anyone who enjoys nature. 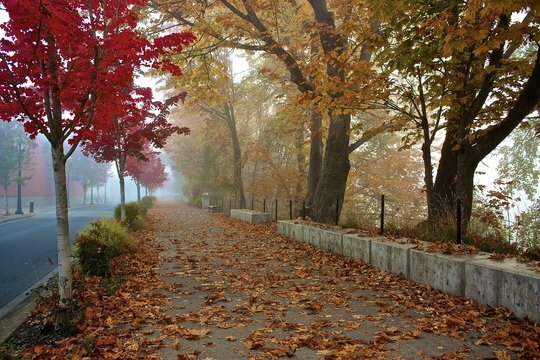 The Willamette River is the site of the Corvallis Riverwalk, the perfect site for a picturesque walk. If you hike up Bald Hill you will be treated to some of the best views of the city. You can also head out to Mary’s Peak if you want to test yourself with some more rigorous hiking or biking. Anglers will also love the opportunities in the land surrounding Corvallis. If you like catching steelhead trout, visit Alsea River. Also, the Willamette River can offer some great bass fishing right by Corvallis itself.